MTN Ghana has recorded a strong performance in its third-quarter revenue driven by its mobile money (MoMo) service, the South African mobile firm said on Friday. MTN Group said the unit’s Q3 revenue grew around 23% boosted, MoMo, a platform which allows money transfer and payments using a mobile phone in Ghana, Reuters quoted a statement from the company. In its report scheduled for release on Monday, October 29, 2018, revenue for the nine months ended 30 September 2018 rose to 3.54 billion Ghanaian cedis ($731.90 million) from 2.49 billion Ghanaian cedis during the same period a year ago. During the quarter, MTN Ghana’s service revenue grew 22.9%, its data revenue increased by 30.9% and digital revenue rose by 28%. In its half-year financial statement released on Wednesday, August 8, 2018, the African phone firm recorded an improved financial report for led by growth in Nigeria, Ghana and South Africa. In the period, growth in EBITDA in Ghana went up by 13.6%, its strongest performance across Africa after the Nigerian unit. 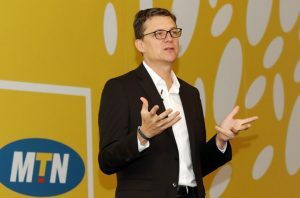 Rob Shuter, MTN Group president and CEO, had said the company posted an encouraging first half of 2018, with an acceleration in the second quarter, supported by an improved operational performance across many markets led by Nigeria, Ghana and South Africa.